Nearest: Tube Station: Marble Arch 123 yards (112 metres), Railway Station: London Marylebone 0.7 miles (1.1 km), DLR Station: Tower Gateway 3.6 miles (5.8 km), Motorway: M1 Junction 1 5.1 miles (8.2 km). The Amba Hotel Marble Arch is located on Oxford Street right by the major road junction of Marble Arch. Oxford Street is one of London's busiest and most popular shopping areas and leads to other busy areas such as Bond Street, Regent Street and Tottenham Court Road. Marble Arch itself is steeped in history and at one point was used as the site for hangings in London (marked by a plaque on the ground). On Sundays Marble Arch is host to Speakers Corner, a popular visitors attraction where anyone can get on a soap box and speak about one of the contentious topics of the day. Close by are three large and popular Parks, Hyde Park (by Marble Arch), Kensington Gardens and Regents Park (home to London Zoo). 200 yards to the East is Baker Street, famous for its connection with the Sherlock Homes stories and where you will find the Sherlock Holmes Museum (0.6 miles). Nearest attractions to the Thistle Marble Arch Hotel include the Wallace Collection (0.2 miles), Madame Tussauds (0.6 miles), Michael Faraday Museum (0.7 miles), Alexandra Fleming laboratory (0.7 miles), Apsley House (0.8 miles) and the Trocadero Centre (1 mile). The Amba Hotel Marble Arch is a large art deco style hotel in a privileged location at the gateway to central London. The hotel has some of the largest guest rooms in London with an average size of 33 square metres (355 square feet). The Amba hotel has its own Mobile Valet smartphone app which lets guests explore the hotel, order room service and enjoy an express online check out. Hotel guests also have their own tablet supplied in-room to use for the length of their stay. Unlimited wireless internet acess throughout. Bedrooms are a mix of the contemporary and classic and average 33 sq metres in size. Each bedroom has en-suite facilities (bath, rainfall shower, toiletries, demister mirror), a Hypnos bed and is air-conditioned. Amenities include high-speed wireless internet access, flat screen smart TV with freeview channels and can be synced with your smartphone, power sockets and usb ports, coffee/tea maker (Nespresso coffee machine), stocked minibar (free), iron/ironing board and in-room safe. All rooms come with a supplied tablet that you can browse the internet on. Deluxe rooms offer additional sofa seating area and a larger en-suite bathroom with walk in rain fall power shower. By the side of each bed is a USB charging point. Executive rooms com with options of twin, double and king size beds and give access to the executive Amba lounge. The Grill: This all day dining restaurant is located on the first floor and has been themed after the 1930's era and is reflected in the furnishings, glassware and cutlery used. Serves classic steaks and seasonal dishes using locally sourced ingredients. Full English breakfast and Continental buffet breakfast served each morning. The Deli: Just off the hotel lobby and open 24 hours a day. Serving a selection of drinks, snacks and sandwiches to enjoy here or take away during the day. In the evening the deli is ideal for a glass of wine dinner and a nightcap when you return. The Deli counter also serves tea and coffee, snacks, home-made salads, paninis and cakes. Afternoon Tea: Traditional afternoon tea with classic sandwiches, fresh baked fruit scones, decadent cakes, strawberry preserves and Devonshire clotted cream. The Amba Lounge: For guests staying in Executive Rooms, Suites or Studio Apartments. Open daily from breakfast until 23.00. For exclusive breakfast, workspaces or some time to relax, coffee or a glass of wine and snacks throughout the day. The Bar: Enjoy a specially shaken cocktail from the in-house mixologist. Full range of beers and spirits. Views of Oxford Street. Perfect for a nightcap after dinner at The Grill. There are no tray charges added which means guests can eat wherever they want with the same menu at the same price offered from restaurant to the lounges or their room. Shower facility and luggage storage available for early arrivals. The Amba Marble Arch hotel also boasts an executive floor, gym facilities, business centre and theatre desk. The Marble Arch business lounge is the perfect place to relax between meetings or at the end of a long day. The hotel has a 24 hour front reception. WiFi high speed internet access can be picked up in all areas of the hotel. Other services include luggage storage, currency exchange, gift shop, dry cleaning and laundry. The business guest will appreciate the hotels eighteen air-conditioned function rooms all with high speed internet access able to accommodate up to 300 guests theatre style. The Amba Hotel is fully non-smoking. Hotel has lifts. Public parking is available in close proximity to the hotel and costs £46 per day. Cumberland Hotel (Gumoan): is 174 yards (159 metres) away, has a guest satisfaction score of 77% and rates start from about £109. Amba Charing Cross: 1.4 miles (2.3 km), rated at 98% and with rates from around £176. Royal Horseguards Hotel: 1.5 miles (2.5 km), rated at 89% and with rates from around £204. Compared to other London hotels: This hotel has been rated 85% by past guests. The London average is 80% and the average for 4 star hotels is 83%. Therefore this hotel is above average for its sector (star rating) and for London as a whole. Guoman/ Amba Hotels across the chain average 85% so this hotel is rated as average when compared to other Guoman/ Amba hotels. Milesfaster ranking: 223rd from 866 London hotels, 4th of 6 Guoman/ Amba Hotels, and 85th of 328 four star rated hotels. Looking for lower base rates? Then another option might be the Chamberlain Hotel. 0.1 miles from the Amba Hotel Marble Hotel (0.2 km), has scored 91% from former guests and whose lowest rates start at about £87 (theres free WiFi too). 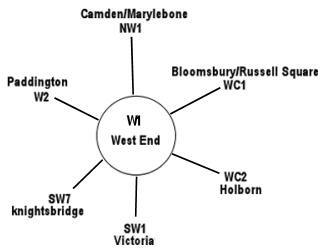 The closest fifty hotels around this area (Bryanston Street, W1 postcode) that are listed on this website cover a 0.7 miles (1.1 km) radius. The numbers for each star rating are 19 five star hotels (average rating 88%), 22 four star hotels (average rating 81%), 7 three star hotels (average rating 76%) and 2 two star hotels (average rating 68%). Top 4 star hotel is Chesterfield Mayfair Hotel at 98%. The highest rating goes to The Beaumont London (5 star) at 99%. For the nearest 50 hotels in the area we have base rate data on 49 of them. If we look at the average for all hotels in the area (nearest 50) we get an average base rate of £240 per night. The lowest rates are at £49 at St George Hotel (3 Star, 61%) and highest base rates of £1000 at 45 Park Lane Hotel (5 Star, 98%). Averages for each sector of star rating: Five Star average: £409, Four Star average: £153, Three Star average: £68 and Two Star average: £69. We rank hotels based on our own proprietary algorithm based mainly on guest ratings but adjusted for influencing factors. We rank Amba Hotel Marble Hotel 22nd of the 50 local hotels and 7th for the 22 four star hotels in the area. The hotel is 34th of 49 (22nd of 22 four star hotels.) for lowest standard rates locally. Looking at the hotels rates plus its user rating we rank it 32nd of 47 for sheer bang for buck (The Arch Hotel was top).